Georgia has a very cute in-the-hoop project for you, a garden apron! 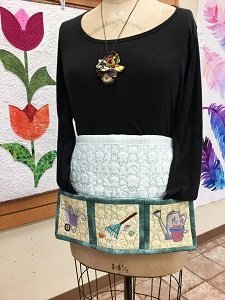 Make this in your choice of fabric and thread colors for yourself or it would make a very nice gift for the gardener in your life! NOTE: Be sure to download both the following documents to be prepared for class. Click here for the In-the-Hoop Garden Apron supply sheet. Click here for the In-the-Hoop Garden Apron design chart. Requirements: Must purchase $15.00 design pack on day of class. Class discount does apply.